This coffee will be fresh roasted for you. We expect Square One Coffee will roast and ship this coffee in 1-2 business days depending on their roasting schedule. This is the Thaddeus Espresso brought to you by Square One Coffee. A balanced and enjoyable coffee, blended with the intention of making a lip smacking double espresso or a decadent cappuccino. 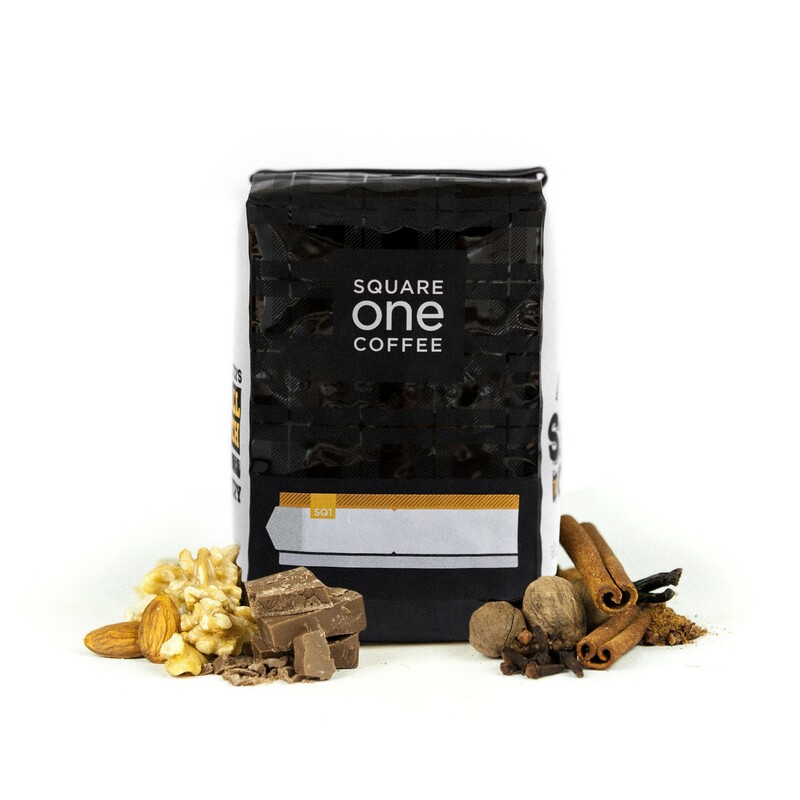 This cup is fantastically rich, with notes of molasses, baker's chocolate, vanilla, almond and citrus. I have said multiple times that I do not like coffee with NUTTY flavor. Please refund me for this coffee or send me a replacement. Possibly the best espresso I've been shipped so far! The aroma of the beans in the bag is enough to make me wilt; this is a fruity, medium roast that hits the sweet spot, for sure. Not a hint of bitterness. Rich and full and vibrant. Excellent all around. This has been possibly my favorite so far. The taste is rich and complex, while still being smooth and creamy. There is the perfect amount of bitterness, just a little bite, that adds depth to the flavor, rather than detracting from it. It's both a motionless, eyes-closed, enjoying the moment kind of coffee, and one that you can (and want) to drink all day! Plus, the Caffeine content is manageable for someone like me, who tends to begin to levitate after half a cup... Lovely. A little subtle, but still great taste. Put stupidly, it doesn't underwhelm or overwhelm, it sits right in the middle. This made much better drip coffee than espresso; I had a terrible time finding a suitable grind for the espresso machine, so this was most likely the reason my shots were way too citric for my taste. Also very enjoyable, would definitely drink again, better as an espresso than the previous coffee. Bean looks like other varieties I enjoy, not oily, not sour or burnt. This makes a delicious shot of espresso for my afternoon lattes! Its roasty and dark without being bitter. I'd say there's a bit more fruitiness to this espresso than nutty or chocolate flavors. Since my first mistobox was split between myself and some guests, I really wanted to make sure I payed attention to this one. I took my time taking in the aroma of the beans -- you can really smell the baker's chocolate! Lying underneath, I eventually detected the toasted almonds and touch of orange peel. Once ground, the balance of aromas changed, but most of the same notes were there, with the addition of coconut macaroons. All of this was really enjoyable, but I have to say the brewed product was disappointing. I used it to make espresso all week (which went into a latte), though I tried the first shot straight. I'm not the perfect barista, but the baker's chocolate was still there as the dominant flavor. I could talk more about the notes, but the thing that made this coffee earn a low rating for me was the sour taste that followed. I love most any tasty coffee - acidic, nutty, sweet, earthy.....bring it on. But actually sour, rather than acidic? I did not think this made the best cup. Not bad! Maybe a little too fruity and light (or too tangy?). We've definitely used it all, but it wasn't a flavor I found myself going back to for another cup. I don't find it to be particularly rich or nutty, but I definitely get a bit of the chocolatey brightness. Roasted way too light for espresso. No matter what I did (with my machine, dose, etc. ) it came out too bright, edgy and thin. The first week was much much better. I enjoyed the strong flavor of this one. It had a boldness that I enjoyed and the after taste wasn't overly bitter. Too light. The coffee tastes watered down. Very balanced all in all good blend. Milk drinks have been great. No complaints with this one. Excellent! Strong, rich dark chocolate notes with a touch of vanilla and citrus. Slightly sweet aftertaste. Medium mouthfeel. Perfect for milk based coffees! Very very flavorful. A little bit bright, but great unique flavor! Too much citrus for me. Doesn't blend well with milk as expected. A little too bright for my tastes but a nice flavor profile. One of my favorite from this subscription so far. I enjoy making Latte art and the crema of the Thaddeux si so rich. My hearts, tulips an rosettas stay until we're finished drinking the cup. This richness translated to the coffee itself so much it tastes like dessert. I don't quite get the citrus but definately the chocolate, vanilla and almond. I've been doing ice lattes with it and I had to prove to a friend I was not adding any sugar. I'm not kidding when I say dessert. haha! My grinder hates this coffee, it sounded like it was dying (beans seem to be a little too hard/light for it). The entire experience was pretty frustrating because I could only get cups with intense citrus instead of the molasses and chocolate that you can obviously smell. There were a couple cups that were decent- the best one out of the whole bag (yup.) featured heavy citrus with the slightest hints of nut and chocolate. I gave this 4 stars because I can tell the potential of the coffee and didn't want to penalize it for the faults of my grinder (80% sure that's most of the problem because it's not able to grind this consistently. Hopefully an upgrade will happen by Xmas). My PF can only do ~16.5g max so I can't try the 18-19g that was suggested for this coffee. Tightening the grind made my grinder hate me, and nearly choked the espresso machine, without benefit. The shots for this coffee were in sharp contrast to the Tigerwalk Espresso before, which came out beautifully. The Thaddeus Espresso also does not have as strong an aroma as the Tigerwalk Espresso, it's quite mild. With my current setup, I think I might have to stick with roasts that are slightly darker than this. We felt this was a little bland for our taste. We like a brighter profile, more acidity and citrus flavors. Fantastic espresso! Probably our favorite Mistobox shipment yet. This coffee was good as an espresso. I thought it was a fairly good pour over too, well balanced and rich with a citrus. I enjoyed this specific roast. Not exactly what I look for, but had very good body, hints of citrus that worked well with the overall flavor. I wished it was a little more full bodied, but overall very good. Good news is I discovered what I don't like in a roast: Citrus. I'm sure this blend is fine for someone, but not me. Just like the description says, nutty and chocolate forefront notes, goes much better with milk than by itself. Second batch always gave a fast pour, regardless of dosing and grind. First batch was more consistent. Otherwise, a pretty good espresso. Balanced and light. Delicious! A hit with friends as well. Very strong. Ironically, makes a better coffee than espresso. Very hit and miss, but in the better extractions, the high notes were smeared into one orangey note....wonder if the blend of beans separated..? Delicious! I like this one as much as I liked the Sugar Skull Blend from Onyx! Can't wait to try Panther next!